LOCATION.--Lat 40°42'48", long 74°07'23" referenced to North American Datum of 1983, Newark City, Essex County, NJ, Hydrologic Unit 02030103, on right bank at the Passaic Valley Sewerage Commission treatment plant in Newark, on the northeast corner of the main dock, 0.5 mi southwest of Point-No-Point in Kearny Point, 0.8 mi west of Droyers Point in Jersey City, and 1.5 mi northeast of New Jersey Turnpike Interchange 14. PERIOD OF RECORD.--June 1993 to September 1999, March 2001 to August 2003, and March 2005 to current year. 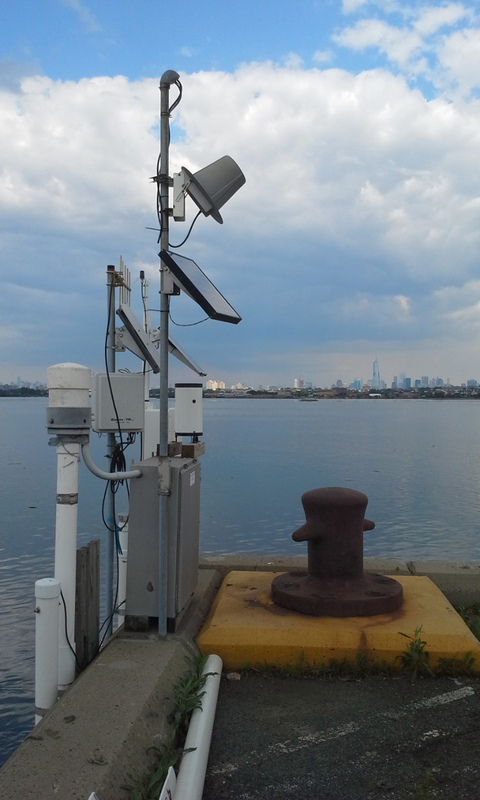 Prior to March 2005, gage located 4.3 mi upstream and published as USGS station 01392590 Passaic River at Newark, NJ. GAGE.--Tide elevation, water temperature and precipitation recorder with telemetry and tidal crest-stage gage. Datum of gage is at 0.00 ft NAVD of 1988. To determine approximate elevations to NGVD of 1929 datum, add 1.11 ft.
EXTREMES FOR PERIOD OF RECORD.--Maximum elevation, 12.1 ft from high water marks, Oct 29, 2012; minimum elevation, -6.18 ft, Mar 9, 2008. EXTREMES OUTSIDE PERIOD OF RECORD.--Maximum elevation known, 7.89 ft, adjusted to present datum, Dec 11, 1992, from high-water mark in the rear of the property of Kearny Municipal Utilities Authority along the edge of the Newark Bay at the southeast end of Kearny Point.